The new generation of the Porsche Boxster will be making its global debut at the Geneva Motor Show at 09:30 on March 6 in Hall 1, alongside the Panamera GTS and 911 Carrera Cabriolet that will receive their European premieres. 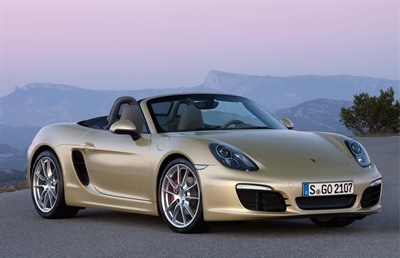 The new Porsche Boxster arrives in the UK later this Spring offering enthusiasts a new generation of the roadster. The technical highlight of the new Boxster is its all-new lightweight body, new flat-six engines with direct petrol injection, a completely revised chassis and styling. The new power unit fitted in the Boxster delivers 265 hp (195 kW) from a 2.7 litre displacement – 10 hp more than its larger capacity predecessor. Technically, it is now based on the 3.4-litre engine of the Boxster S. The 3.4-litre now delivers 315 hp (232 kW), 5 hp more than before. Both models feature a manual six-speed gearbox as standard, with the seven-speed dual-clutch Porsche Doppelkupplungsgetriebe (PDK) available as an option. 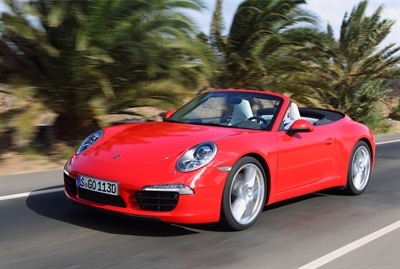 Built in Zuffenhausen, Stuttgart, the new Porsche Boxster will go on sale in the UK from May 5. The Boxster is priced from £37,589, and from £45,384 for the Boxster S.
Porsche is unveiling the 911 Cabriolet to a European audience right on cue for the open air season. The 911 Cabriolet shares its new, high tech aluminium-steel body with the Coupe and ensures reduced weight for increased responsiveness and lower fuel consumption. The new 911 models are on sale now; the Carrera Cabriolet is priced from £79,947, the Carrera S Cabriolet from £89,740. The second European premiere, the Panamera GTS is its uprated 4.8-litre naturally-aspirated V8 engine benefiting from modifications to give it enhanced performance. The 30 hp higher engine output and 20 Nm greater torque (compared with the power units in the Panamera S/4S), results in the GTS producing 430 hp at 6,700 rpm and 520 Nm at 3,500 rpm. For maximum performance, the muscular V8 drives all four wheels via a seven-speed Porsche Doppelkupplungsgetriebe (PDK) transmission. The four seater GTS has a kerbweight of 1,920kg and can accelerate from 0-62mph in 4.5 secs, and on to a top speed of 179mph. The Porsche Panamera GTS is on sale now, priced from £90,409.